Dives as explained before, the "multiline text" will allow us to write text on multiple lines, but these will be created as a single object. 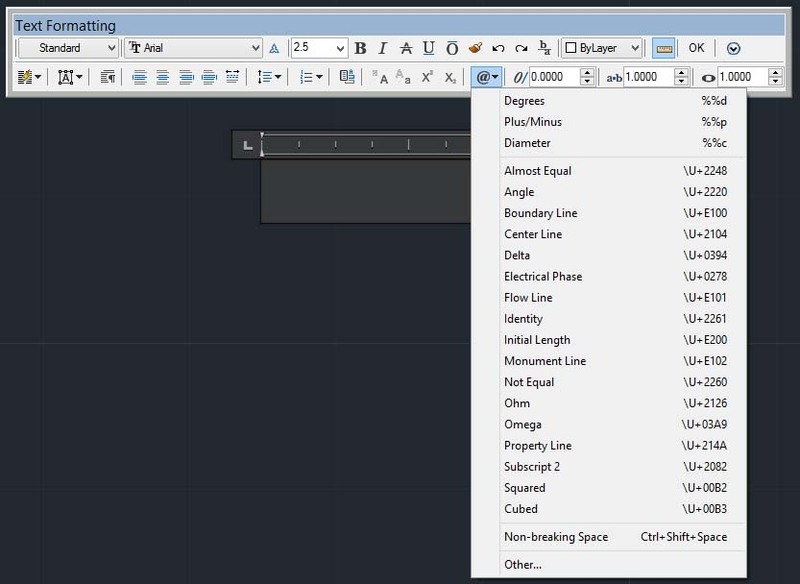 Clicking the command on "text toolbar", AutoCAD prompts us to insert the two corners of a virtual rectangle, which represents the area in which we will write the text. We then click on the screen to establish the two points as if you draw a rectangle. Subsequently, here AutoCAD behaves differently if we are working with the classic interface or the new. In the top left there are three drop-down menu, you can select the first one of the “Text Style” created. Second, you can choose the font to use (by default that we set in text style, but you can also use a different one). Go on the third menu and type the height of the text. All of this, we can do it before or after you start writing, but in this case we must remember to select with mouse the text already written in the text area, otherwise the changes will only affect the text you write after. We have then the three buttons to bold, italic and underlined text setting. Further right is another drop-down with the colors, by which to assign a color to text or part of this. If we change the color of the multiline text through this command, then only we can change this because the changes to the color that eventually we will try to do by “properties toolbar” will have no effect. Still to the right there is the OK button, this button serves to confirm what we have written in and exit. At the bottom left of the toolbar there are six buttons for text alignment on the virtual area established at the beginning of the command, then left, center and right, and top middle and bottom. In the three windows on the right hand, respectively, we can set the angle of the text in degrees, then the distance between the letters and the width factor of the same. Just before these last three windows, there is a button with the symbol “@” through this command we can write symbols like the Plus/Minus ±, the diameter Ø, etc. Clicking this button will open the following menu, on which we will select any symbol to be write. Note that each symbol corresponds to a particular sequence of letters, for example, the symbol of the diameter corresponds to %% c, which means that if on a line of text in AutoCAD, write one of these keystrokes, will be written the symbol correspondent. We find all the same functions of this command also on the control bar used with the new interface of AutoCAD, although arranged in a different way.